Property owners are required to have an EPC (Energy Performance Certificate) whenever a property is built, sold or rented. The certificate must be ordered before you put the property on the market or before tenants move in. Any properties having works done under ECO or Green Deal also requires an EPC. An accredited Energy Assessor visits the property to collect only the data required for assessing energy features, and generates an Energy Performance Certificate (EPC) using government-approved software. 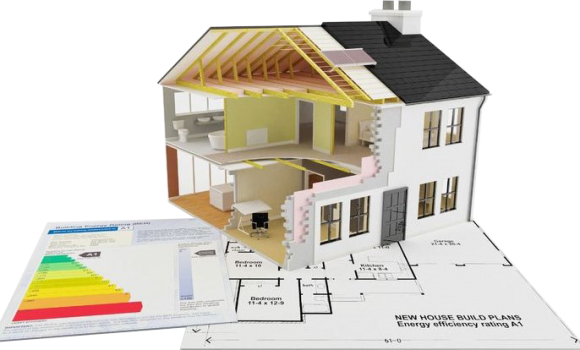 The assessment is based on the construction and type of dwelling and relevant fittings (heating systems, insulation or double glazing, for example). 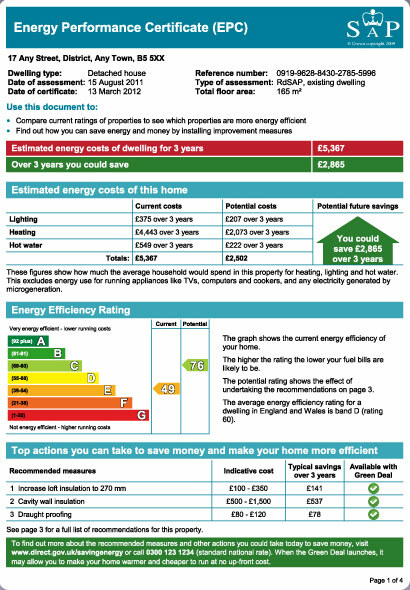 Based on this information, the EPC shows you how good- or bad- your property’s energy efficiency is. It rates your property’s energy efficiency from A to G, with A as ‘Very Efficient’ and G as ‘Not Very Efficient’. Step 2: The assessor needs access to every room in the property. He counts is the number of light fittings you have, and the number of low energy light bulbs you use. Low Energy light bulbs are the CFT or LED type or normal florescent tube sort. Only fixed fittings are included in the EPC survey. Step 3: The assessor carries out a head and shoulder inspection of your loft space if this is possible. This is to check how much loft insulation is present and where it is located, either laid on the joists or affixed to the rafters. The current recommendation is to have 270mm of loft insulation laid at the joists. Whilst in the loft we also try to establish what type of wall divides the property from next door. All Energicert assessors carry their own surveyor’s ladders, so you don’t need to provide it. Step 4: The assessor makes a visual inspection of the windows to find out if it is single, double, triple or has secondary glazing. If there is double-glazing, he checks if it was installed before or after 2002. If you have a FENSA certificate or BFRC data to hand, he will take this as evidence. In certain circumstances, we also check the thickness of the gap in double glazed units. If your property has a conservatory, he will also inspect this and take details. Step 5: The largest parts of the calculation for the EPC is your property’s heating system. If you have one or more boilers, it is useful to have the handbook for that particular model to hand for the assessor. The assessor takes note of the time and heat controls. If you have one or more room thermostats, he also notes this, as well as any thermostatic radiator valves fitted in your house. He also records any other form of heating such as coal, log, or gas coal-effect fire. Step 6: During the EPC survey, the assessor takes photographs of the various elements that have been surveyed and some photographs of the outside of your property. Each month a number of the surveys are called in for audit by the accreditation bodies to ensure that a high standard of survey is maintained and we need photographs for this purpose. Step 7: During the EPC survey, the assessor takes a number of measurements including the height of the main rooms on each floor and the dimensions of your property. Before leaving, the assessor sketches a plan of your property noting any extensions, alterations, and measurements.